Well, day one is coming to a close. It was actually easier than I expected. Except the leaving my mom this morning. That wasn’t easier. It’s been a really long time, over 15 years, since I moved from the state. Back then I was too fucked up to feel anything about it. Today, I know what I’ll be missing. I love my parents very much and I’m gonna miss them like crazy. But, I’ll be back to visit and there’s always the Internet and phone calls. Hell, we might even be talking more. So, after the painful goodbyes I was ready to go. Actually first, I had to load up the cats. I got my car set up with two big carriers that take up the whole back seat. I got the two black kitties, Shadow and Sparky, in one and R.J. in the other. Pachelbel was sitting in the front seat with me. I had taken the whole brood to the vet on Thursday and he told me to give them Benadryl for motion sickness or if they needed some sedation. Shadow, the old lady, tends to get motion sick so I gave her some Benadryl. Well, I tried to give her some. She foamed at the mouth for a while and then threw it up. So much for the Benadryl. Oh well. I got them all loaded up, I got Pachelbel hooked up with her seat belt harness and off I went. All went well until I took a wrong turn and ended up in Menard instead of Junction. It was a thirty mile mistake. But, I took a shortcut and only got about 45 minutes behind. Once I hit I10 in Junction, I had 444 miles of absolutely nothing. And when I say nothing, I mean nothing. No towns, no houses, no gas stations. Nothing. Well, there was the occasional gas station. There’d have to be. But those were usually about 60-70 miles apart. What was really interesting though was watching the land shift from the familiar hill country that I grew up with to the stark, barren mountains of west Texas. I stopped about every hour and a half or so to let Pachelbel pee and stretch my legs. I also got gas every chance I got in case the next gas station was too far away, lol. The only scary one was in Kent. It was nothing but a falling down building with truly questionable restrooms. But when you gotta go, you gotta go. Pachelbel likes to smell everything she can reach before she pees so we did a lot of walking around. I got to El Paso about 7pm or so. I gained an hour along the way so it was actually 8pm my time. I left home at 10am so it was a 10 hour trip. It would have probably taken 9 if I hadn’t taken that wrong turn. Oh well. It was a pretty drive at least. So, now I’m kicked back at the La Quinta. 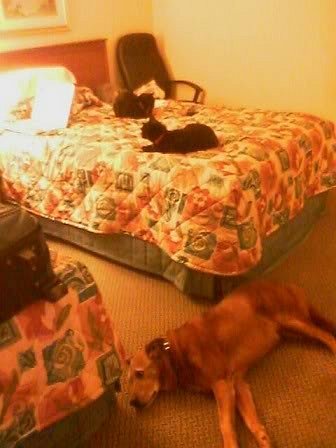 They are a pet friendly hotel that doesn’t charge extra for the pets. A big winner in my book. I’m stuffed full of pizza and now I think it’s time to go to bed. Tomorrow I’m headed to Mesa where I’ll be hooking up with Elsieaustin! Yay!!! I just hope she’s ready for me and the brood to stay the night.